Tirupattur is a quaint little town in Vellore district. My paternal ancestors moved in there a couple of generations back, and carved out a reputation and a couple of blocks of roads for themselves. Half my holidays during childhood were spent at this place that gave me wonderful experiences of life in the countryside. And I just loved it! My grandpa had 7 kids - 3 sons and 4 daughters in that order. And all those 'kids' spawned families of 4 or 5 members each. Each one of these families was in a different place - Chennai / Bangalore / Hyderabad / Ramanagaram / Vellore / Tirupattur itself. 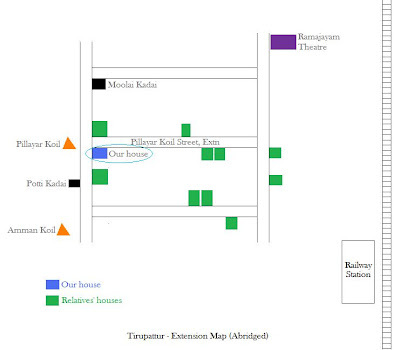 But during hols, most of us would gather at 23, Pillayar Koil Street, Extension, Tirupattur (N.A Dist) - 635601. The house was one of those typical ones you see in the movies - a fairly big, tiled house. The main gate led to an open area covered with a pandhal. Three steps directed one to a heavy wooden door flanked on either side with some seating space (thinnai). Grandpa's easy-chair was located here, and this is where he would lie down comfortably when someone came to meet him. Evenings saw the arrival of cows for milking here. The main door opened into the hall - or the 'fan room' as it was called in the household. Maybe it was the first room that was fitted with a fan. Dunno. Crossing over from the fan room, one would enter a corridor that went around a yard right in the middle. There were a few rooms lined up along the corridor (bada room, store room, chota room). The yard was covered on top with some grills and housed a Tulasi mutt that had an integral role in Grandma's pooja plans. Our farmlands were about 3 kms from our house. Every morning, it would take loads of efforts from all the parents to coax us to have a bath in the house. We guys would tie towels on our heads and get ready to go to our farm for swimming. More often than not, we would keep roaming about that way for a couple of hours before resorting to a 2 minute bath in our house itself (Hunger!). But Balaji (my closest cousin there) and I would visit the farms at least once in 2 - 3 days and soak lazily in the water. It used to be an amazing feeling - with the sun beating down from the top, and the water keepin one's lower latitudes ultra cool, and a pleasant green cover all around. I guess you know how hungry one gets after swimming in the sun for some time. So, whenever we went to our farm, as soon as we jumped into the pool the workers there would go and get us Parle G biscuits and "cool drinks" (Live - O / Love - O / Love One or pure simple color soda). And yeah, all this apart from the numerous tender coconuts! Live was heavenly. I (barely into my teens) would order around 30 and 40 year olds who would oblige with pleasure! (They used to call me "manager" after my father's designation at office). At the peak in summers, the house would swarm with 33 people. 2 grandparents, 14 uncles/aunts/parents, 17 cousins - all under one roof!! At no point would the house be quiet. And if you count all our relatives living in the same street or the next, definitely the number would rise to a couple of hundreds. My Grandpa was a very friendly, easy-to-go-with man. At the age of 78 he would come and play cricket with us! Just for a couple of overs. But still, at 78! He was physically very able - he could move a 4 ft big drum full of water without any help! And he always made sure people around him were very happy. All this until 10 years back. In March 1998 my Grandpa breathed last. It was a pitiable sight to look at the man waste away within half a year to such an extent that he wasn't able to turn around in his bed without help. So much that when he died, we felt a bit relieved that he didn't have to suffer any longer. My sister's 10th standard results came out 2 weeks later. She had come school first. Had my Grandpa been alive, he would have relished the news and spread it around in a jiffy throughout the town! The very next year, when I went to Tirupattur for hols, there were just 2 of us - my Granny and myself. It was initially exciting. The thought of having the house all for myself was just so fulfilling. Or so I thought. Just a couple of days later, I began to feel bored. The house seemed unusually huge... the life was just not there. And I spent hours everyday watching TV - the one that had been bought when Grandpa was in bed to keep him engaged. That was sort of the last nail in the coffin. For more than a decade, we had never realized the absence of a TV in the house. And now? From then on, all my stays there were largely alone. The next time the entire house was in full strength was in April 2002 - when my Granny died. Now officially it was all over. Her death seemed to signify the end of my trips to Tirupattur. The whole house seemed distant and remote. As if it belonged to somebody else. As if I was just a visitor. One month after her death, my class 12 results came out and I had topped the state. It's been 6 long years after that when I have visited Tirupattur hardly 4 - 5 times; nothing worth a mention. What made matters worse was that each time I went there recently with fond memories of the crowded past, I was greeted by the chilly solitude of the present. Kids have all grown up, and elders have grown older. I do not know whether it was the innocence of childhood, but I somehow feel people were happier 10 years back than they are now. And that is so damn inconsistent with my image of Tirupattur. Why do we have to grow up?! Granddparents seem to make life so much fun :) And somehow I do get the feeling that when the sun in their lives is setting it takes on a new meaning to have grandkids. In any case, theyre almost always the sweetest people around! Am sure glad I didnt miss out on my time with them! Good read on a sunday morning to bring back a lot of my own childhood memories! Glad u chose to read such a long prose on a Sunday morning.. But another did mention that this reminded him of RK Narayan and his style of description.. Very happy to hear this :) thnks! Very nostalgic.Could associate myself with every bit of it.Had similar experiences but deep down south in Nagercoil. Vishy, what a post and what philosophical (not bring though) facts! Many times, I wonder that inspite of being around with the same people, same place, same atmosphere - the magic which the past seemed to offer cannot be re-lived in the present. And visiting a place, attached with so many good memoirs, after a long long time makes the same place seem nice but a bit haunting - isnt it? Its like an oxymoron. I have always regretted not having a granparents' house to visit(3 out of 4 of my grandparents having passed away quite early). More so, after reading this post. Nagercoil.. Hmmm.. Can imagine the small town feel you too must have relished..
Do you still go there? Very true.. Even the same place does look different with time even if nothin actually chnges physically.. Something to do with our mental associations..
And 'haunting' is the word alright :D interesting observation..
Hmmm.. Can understand.. You are welcome to visit TPT the next I myself go! But what abt your 4th grandparent? He/she from some place other than CBE? Surely everwhere ppl have changed in due course of time.. Healthy Relationships are also reducing..
As of my knowledge value to people/individuals have also reduced a lot..
Its not everyday we get such old memories.. Your post made me also to go back to my old memories.. Thanks to Brindavan Express.. Uh, thanks for the offer, Vishy! It seemed like a diary entry and very nostalgic. I have hardly been to my native place but can understand how it feels to recapture memory. vichu.. agree with ajai.. Totally malgudi days-ish.. Its like Swami is reminiscing about the past.. touching man.. I think all of us had a rural house that grandparents made for us. I dont know how all that just vanished.. But I guess its bound to happen.. We would create some different experiences and subsequent memories for our kids and grandkids, those that they'l blog about as the best childhood memories and wonder where all those innocent days went off.. Very touching post Vishy. It brought me the nostalgic memories of my childhood in my grandparent's house in our native village. True, its real irony - we were much happy 10-15 years back than we are now..I like the way you write, anybody can sensitize with you..
Ive got 0/4 now n i could appreciate every phrase in urs.. Kudos !! Am not sure if it's all truly the way we are 'feeling' (like u said, healthy relationships are reducing), or is it just that as we grow up, we slowly get to know the real state of affairs.. Thanks thalai.. Glad that you feel the way I do too..
0/4 :D Took some time to understand what that meant!! But ya.. It's in these times that one wonders why isn't there a time machine yet..
Bur of course.. When have we both stepped out of that mode? Caught up with a whole lot of stuff this past month and a half.. But hopefully will be posting within this week.. Very nice one da! It reminds of the days I used to spend in Mettur (town near Salem). We used to bath for hours in the dam & get home ravenous.... Childhood is awesome!